W R. Loosemore has traced our Loosemore family back to the small village of Creacombe, off the road between Tiverton and South Molton. Creacombe, where our story starts, is one of the smallest and most remote parishes in Devon, completely lost in high and moory country, almost all lying between about 600-850 feet above sea-level. A mere 1050 acres in area, or barely a tenth the size of Bishops Nympton, the parish lies about ten miles north west of Tiverton, sandwiched between Rose Ash to the west, Rackenford to the east, Knowstone to the north and Witheridge to the south. Even today Creacombe contains no semblance of a village. 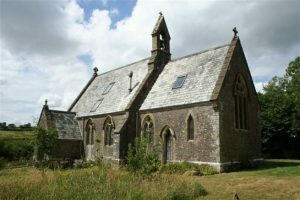 The parish centre is simply a few cottages or small houses clustered around the church which, sadly, has been de-consecrated and is in a ruinous state. At the time of the great lay subsidy of 1524 the parish was so unimportant that it received no mention at all. The first known mention of the name Loosemore in Creacombe occurs in the parish returns for the lay subsidies of 1542/3 and 1544/5, when John Lowsemore/Losemore was assessed on goods valued at £5 (1542/3) and £8 (1544/5). At that time Oakford and Bishops Nympton were the only other parishes in Witheridge Hundred in which the family name occurred. Nothing is known of John Losemore’s family, for the parish register extends back only to 1696 while the Bishop’s transcripts, which start in 1607, are extremely fragmentary until after the Restoration in 1660. We need attach no significance to John Losemore’s omission from the Creacombe returns for the group of three subsidies between 1549-1552 in view of the parish’s unimportance; only one name, that of John Dodge, appears in each return. The woollen cloth industry was expanding rapidly. Living as landowners in the hill country of Creacombe, the Loosemores are likely to have benefited from this. In 1548 the Subsidy Act was passed, taxing sheep, wool and cloth. The aim was to check the speed of this growth and restrict enclosures. We do not know who John Loosemore married, but he appears to have had a son, John junior. Since this John appears to have inherited his father’s tax liability, we assume he was the eldest, perhaps the only, son. The date of his birth, c.1549 gives John senior a probable birth date around 1515-20. This was in the early years of Henry VIII’s reign, before the Reformation. By the time their son was born, John senior and his wife had lived through the turbulent reign of Henry VIII and seen him succeeded by his young son Edward V1 in 1547. In the 1569 Muster Roll, the returns for Creacombe and the larger parish of Romansleigh are combined. No Loosemores are listed. Even if John senior had died, his son should have been old enough for military service. However in the next surviving [tax]return, for 1571, John Loysemore is one of four parishioners, assessed this time on land valued at 40s. ; James Dodge is assessed on land valued at 12s. The name occurs in the proceedings of the Barnstaple Archdeaconry Court, when in a hearing at South Molton ‘John Losmore of Creacomb where he was born, aged 23’ was called as witness in a libel case. The court summary is not dated but the previous case was heard on 4 November 1572 and the following one on 21 January 1573 [both dates in New Style]. So the younger John was probably born c 1549. By chance, the complainant was John Dodge ‘of Aysh Rasse [Rose Ash] where he was born, aged 28’, so he may have been a son of the James Dodge of Creacombe who was assessed in 1549-1552 but who left the parish to live in Rose Ash. This information allows us to assume that John Losemore the elder, who may have been born about 1520, was assessed in 1544/5 and perhaps in 1571. In view of this early connection between the Loosemore and Dodge families, it may be of interest to note that John senior’s great-great-grandson Nicholas married Joan Dodge, after both families had moved to neighbouring Rose Ash. We have no information about when John senior or his wife died. The only other extant 16th century returns are those for 1582 and 1592, in each of which John Losemore is the sole name in Creacombe to be assessed on land, in each valued at £3. We cannot be certain which John Loosemore this was, but it is more likely to have been John junior. W.R. Loosemore, Loosemore of Devon, an outline family history. www.loosemore.co.uk. Chapter 8 and Family Tree. See the Act and Deposition book of Barnstaple Archdeaconry Court 1570-1579, deposited at NDRO, accession no. 1127EA/AD1, transcr. P Christie as Of Chirche-Reves, and of Testamentes, pub. 1994 by Devon Family History Society, see pp33-4.